Researchers from Arizona State University's School of Earth and Space Exploration have combined their sensors, biotechnology and instrumentation expertise to develop a portable, autonomous device that analyzes trace elements. The highly miniaturized microbial analysis machine, called the ddPCR Bioanalytical Field Instrument, allows researchers to do things such as detect microbes in water, soil and the upper atmosphere. 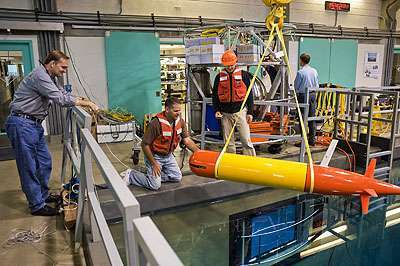 Developed by a team led by experimental physicist Cody Youngbull, assistant research professor in the School of Earth and Space Exploration, the technology was originally intended for deployment on an Autonomous Underwater Vehicle platform as part of a project to map the dynamic microbial diversity in the world's oceans. According to Youngbull, while it does have health applications since it is able to quantify pathogens, he doesn't see it as a medical diagnostic tool. "It's designed for exploration," he said. "Being able to detect trace components, single molecules, autonomously and reliably, without the need for sample return or hardware consumables in a really tiny, low-power package are what our machine is all about." Autonomous, digital droplet PCR is useful for many aspects of science. The device might even one day be integrated into a rover, lander or orbiter to seek out extant DNA in the water on Mars, the oceans of Europa, the ice plumes of Enceladus or wherever scientist-explorers one day hope to discover and quantify nucleic acid sequences.